In new research published in the Journal of Experimental Medicine, Northwestern Medicine scientists have demonstrated that a unique population of immune cells plays a key role in the development of pulmonary fibrosis. They also showed that targeting such cells could lead to new treatments for the disease. The study, a collaboration across multiple divisions, departments and schools at Northwestern, was led by Scott Budinger, MD, chief of Pulmonary and Critical Care in the Department of Medicine, and Harris Perlman, PhD, chief of Rheumatology in the Department of Medicine. Pulmonary fibrosis—including idiopathic pulmonary fibrosis and scleroderma-associated pulmonary fibrosis—is a fatal disease marked by scarring and hardening of lung tissue. The cause is often unknown, and there is currently no effective treatment. Previously, it was generally accepted in the field that immune cells were unimportant to the development of pulmonary fibrosis. But data from Northwestern's extensive research program in scleroderma—an autoimmune disease closely tied to pulmonary fibrosis that results in hardening of the skin—suggested immune cells may actually play an important role. 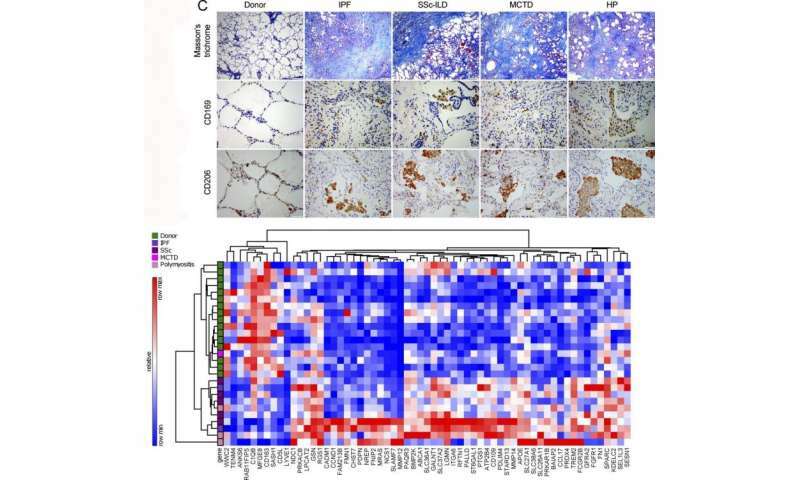 To test that hypothesis, the team of scientists utilized next-generation sequencing technologies and novel animal models generated at Northwestern to trace immune cells throughout the progression of pulmonary fibrosis. They also applied those tools to the analysis of tissue samples collected at Northwestern Medicine hospitals, correlating the animal model data with the patient samples. "One of the strengths of our study is that we go from bench to bedside," Perlman said. The scientists discovered that a new sub-population of immune cells called monocyte-derived alveolar macrophages were in fact a key driver of disease development in pulmonary fibrosis. Further, the genetic deletion of this population of cells prevented fibrosis in mouse models. "This will be transformative for the field," said first author Alexander Misharin, MD, PhD, assistant professor of Medicine in the Division of Pulmonary and Critical Care. "Pulmonary fibrosis is a complex disease—it's not driven by a single gene or cell type—but this study now demonstrates that these immune cells play a key role. This will change the current paradigm." The findings have important implications for the development of future therapies, especially given that targeting such cells may lead to fewer adverse effects. "These cells are attractive for therapy because they don't need to be there. They aren't necessary for normal function or developmental purposes," said Perlman, also the Mabel Greene Myers Professor of Medicine. The new methods used in the research could also spark future research in the field. "This is a novel application of genomic technologies to understanding pulmonary fibrosis," said Budinger, also the Ernest S. Bazley Professor of Airway Diseases and a professor of Cell and Molecular Biology. "By showing that these technologies can be directly applied to patient samples, we offer the promise of incorporating them into personalized medicine approaches. It creates a resource for the research community to develop novel therapies." The team is now actively deploying these technologies to examine lungs from patients with pulmonary fibrosis, fibrotic skins from patients with scleroderma and joints from patients with rheumatoid arthritis to identify other common immune mechanisms in fibrosis that might be targets for new therapies. Budinger, Perlman and Misharin are also members of the Robert H. Lurie Comprehensive Cancer Center of Northwestern University. In a separate finding, the scientists discovered that injury to a mouse early in life permanently altered the immune cell population in the lungs, findings that could have implications for aging research. "Severe injury early in life permanently changes you, in a way that might impact your susceptibility to disease when you get older," Budinger said.